Clusters of small, white-throated, pale pink, bell-shaped flowers appear for several months from midsummer above the mounds of mid-green foliage. 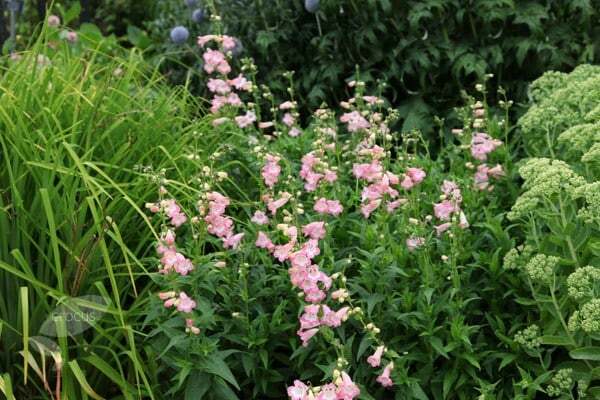 This pretty perennial is perfect for the middle of a sunny, mixed or herbaceous border, where it will mix happily with richer pinks, white and most shades of blue or purple. For the best results chose a well-drained site as it strongly dislikes waterlogged winter soils. Lovely plant long flowering period. A very useful perennial that works well wit other coordinate perennials. Survived last winter. I was actually sent one of these by mistake in a batch of "Ravens". However this is an extremely pretty flower the pink is almost luminous. Generally really pleased with penstemon; tall and strong and great show of flowers. Will be buying more!